If you’re already too late making dinner reservations at that special spot that was supposed to impress your Valentine’s Day date, you may be in luck. 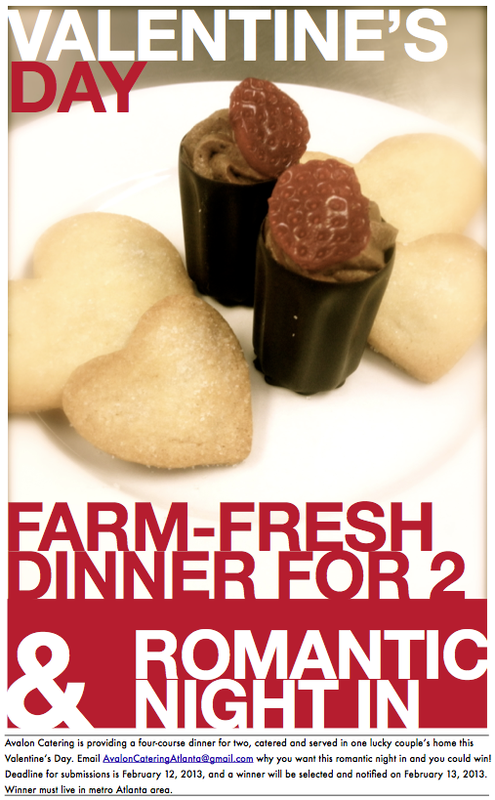 Avalon Catering, a farm-to-fork caterer in Atlanta, Georgia, is providing a four-course dinner for two exquisitely prepared and professionally served to one lucky couple in their own home on Valentine’s Day. Email AvalonCateringAtlanta@gmail.com explaining why you want this special night in, and you could be selected to win an expertly crafted dinner without the restaurant rush. Avalon Catering is a full service caterer and event planner in Atlanta, Georgia with a commitment to only the highest quality locally grown ingredients for the food it serves and the custom-designed event services it provides. Since its founding in 1992, Avalon has established a reputation as one of Atlanta’s premier caterers recognized for world-class cuisine and flawless execution. Avalon’s catering services have an emphasis on farm-to-fork cuisine and a large majority of ingredients are locally sourced and house made. In addition to catering services, Avalon provides event planning for weddings, corporate functions and special events.